Let’s suppose I’m a director back in the fifties, and they’ve asked me to helm Some Like It Hot instead of Billy Wilder (yikes!). Here would be my strategy for handling Marilyn: We’d start work, and for the first few days, maybe a week, she’d show. Then troubles start. Ailments real or mostly imagined, Paula Strasberg horning in, MM locked in her dressing room, etc. What’s my next move? Having read several Monroe bios plus Tony Curtis and Mark Vieira’s outstanding new The Making Of Some Like It Hot (above), I’d be armed with twenty-twenty hindsight and a sure plan. First, I do nothing. Let several days pass without calling MM or begging outside her locked sanctum. She’d wonder what was amiss. Then I’d quietly tell everyone to just stay home for a day. UA would lose money, but no more than’s wasted trying to reason with an actress mad as a March hare. Next would come my capper. I’d bring in Mitzi Gaynor, having intended her for the part to start with, then go forward on Some Like It Hot as if she were the final choice. Would Marilyn emerge from the impasse like Judy Garland when Ginger Rogers suddenly turned up to do The Barkeleys Of Broadway? It would all be a bluff of course (my publicist would call it A Bold Stroke for the benefit of Variety subscribers), but here the MM of my imagination relents, is ready to work, apologetic, and properly chastened (in real life, of course, she’d grind me to powder and the Mirisches would pick up my Guild card). Crazy as she was, Monroe was watchful of those who’d undermine her position. Even on Something’s Got To Give, she had spies reporting from the set to her alleged sickbed. I can’t go back and fix what was broken in 1958, but dreaming how I might, inspired by this book, confirms fascination the saga holds for me and serves too as solid endorsement of Mark Vieira’s day-to-day account of Some Like It Hot’s production, enhanced by star Tony Curtis’ vivid recollections. Plus Tony drops a now-that-Arthur Miller’s dead-it-can-be-told bombshell that makes for lively reading. All this for me was like being on the set. Small wonder I’d fantasize at running Billy Wilder’s show and rewriting movie history. You might too after reading this just published marvel of scholarship, on-set intrigues, and hotcha celebrity gossip. Sooner or later you have to ask, just how funny is Some Like It Hot? Tony Curtis likes reminding us that the American Film Institute called it the Number One laugh-getter of all time. I missed SLIH in 1959, but am told it convulsed packed houses. Wilder actually had Jack Lemmon shake maracas during one dialogue scene to bridge between laughs that would otherwise drown out lines. Some Like It Hot probably seemed funnier fifty years ago because it was lots naughtier to patrons then. Conventions were easier outraged in those waning days when at least some of them were left. It’s still unconventional in terms of gender bending. When was the last time leading men wore dresses? Some Like It Hot doesn’t seem to have initiated a trend toward that, although Bing Crosby did assume femme disguise in 1960’s High Time, and that was likely enabled by the Wilder film’s notoriety. Some comedies are great even when you take away the laughs. 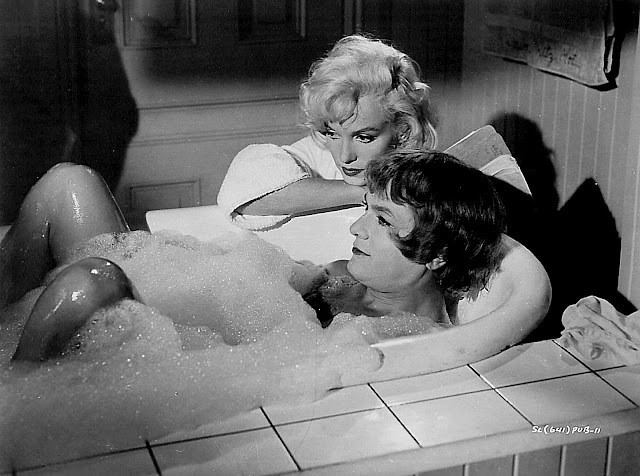 Some Like It Hot is so well structured and entertaining as to get along without guffaws an initial viewing evokes. It’s fun for me, but was never funny-funny. Guys in skirts are inherently delightful to some people, leave others cold, and make a few uncomfortable. The appeal of this show is way subjective, more so than with most classics. I saw it the first time on NBC Saturday Night At The Movies (never mind UCLA or NYU --- this was my film school). The striking thing then was suspense and danger Wilder achieved right from opening bell (and note we hear just that at the end of the credits). 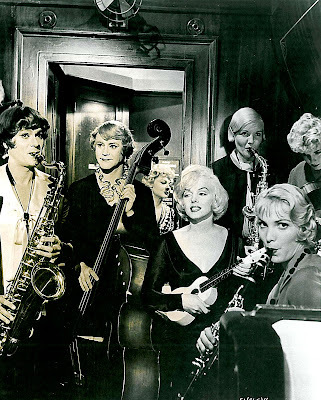 Some Like It Hot was a better gangster picture than most others of that kind played straight. I still consider Wilder’s the most chilling depiction of the St. Valentine’s Day Massacre. He was brilliantly right upping the stakes to life and death for his two leads. It’s what makes 129 minutes go by minus fatigue, that being the sad lot of so many comedies wearing out welcomes in half as much time. What always thrills me in Some Like It Hot is that moment going into the third act when we’re looking at the floor of the hotel entrance and here comes Raft, identifiable by a close-shot of spats we align with carnage in Act One. Imagine shared intakes of breath among audiences seeing it first-run. Wilder had his firmest grip on a public at that deathless and showmanlike bump. He must have looked back often from a late sixties and seventies decline to wish he had such mojo back. Was it accidental that BW chose 1959 to reacquaint us with so many movie faces we were seeing nightly on the Late Show? Wilder likely knew this was the apex of a country’s awareness of old movies, thanks to television’s pre-48 avalanche. 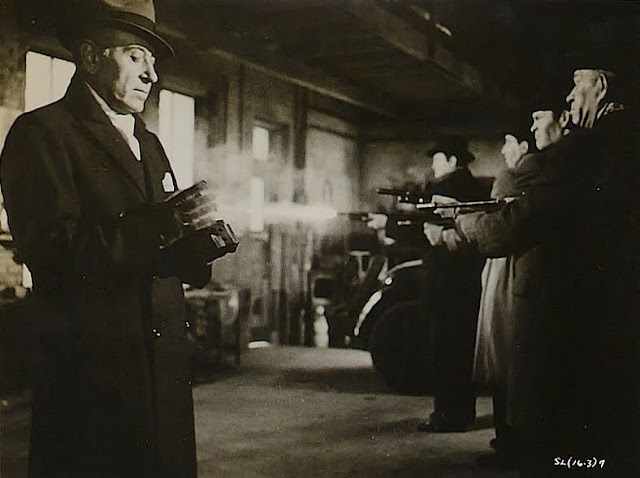 George Raft, Pat O’Brien, and all those character faces were practically living in homes from 1956 when all the old Warner crime and gangster shows fell like pianos into America’s after-hours consciousness. The bucket of Joe E. Brown comedies on TV made his face again familiar, it’s being done monochrome hot-wiring Some Like It Hot viewers to comfort of their living room chairs. What a shame Edward G. Robinson bailed out. Accounts say he refused to work again with George Raft after their dust-up on the set of WB’s Manpower in 1941, but weren’t they together in A Bullet For Joey just a few years back of Some Like It Hot? Hard to imagine Robinson turning down work during the hard-times (for him) fifties. There must have been some other reason we’ll never know about. Wilder’s period remove to the twenties worked fine because folks felt at home there, thanks to his brilliantly chosen cast. The thirty-year back references were less impenetrable for first-runners who’d at least heard of Valentino and Fairbanks/Pickford from elders. Today such names bandied in Some Like It Hot flatline with nearly everyone watching. The music will never fade, though. Wilder had an ear for standards that worked like charms with his characters. Where’s the book about this director’s tuning brilliance? His selections were proof that Wilder was at heart a romantic. He always knew what themes worked best. I was with a girl once who had no particular interest in movies, but hearing me absent-mindedly hum a song, she immediately chirped up, Hey --- that’s from "Sabrina"!, and sure enough, it was. 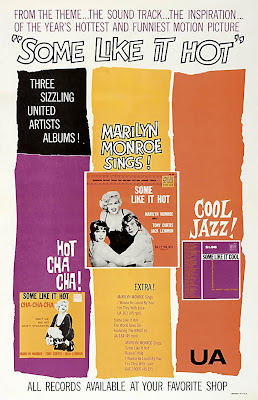 There were three albums issued for Some Like It Hot by United Artists’ platter branch. That must have been some kind of record (pardon pun), and surely bolstered rentals. Domestic and import reprints are still kicking around on CD. I wish I were listening to one of them now. More Some Like It Hot imagining here --- this time at a UA marketing meet. 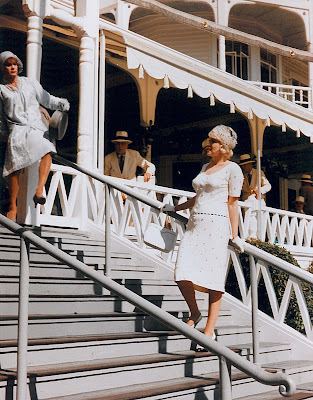 Coming in Part Two on Marilyn Monroe --- Niagara and Something's Got To Give. 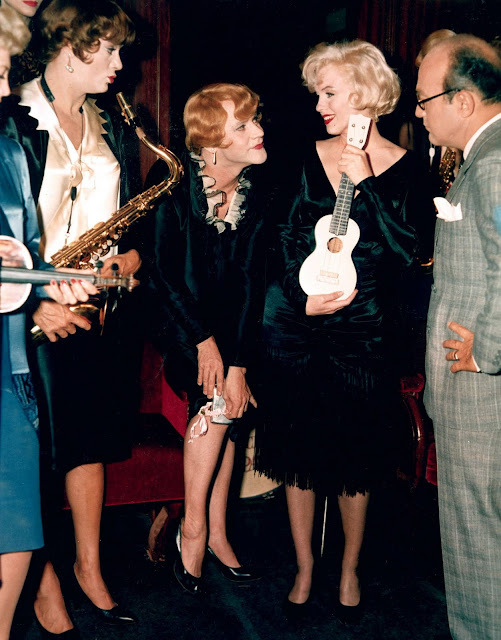 I did see Some Like It Hot first-run in '59, John, and I can attest that the laughs were virtually nonstop; the maraca-shaking was definitely a necessary ploy. And here's another one of those quotes that I'd give anything to remember my source for. I seem to recall it was in a book with a title something like If You Can't Say Something Nice, a compendium of famous people saying snarky things about other famous people. A quick search of Alibris reveals books by that name, but not the one I'm thinking of. In any case, the quote remains vivid in my mind (accurately or not), and it's from Billy Wilder: "They say Hollywood killed Marilyn Monroe. It's the Marilyn Monroes who are killing Hollywood. She was mean, the meanest person I ever met." I remember that quote too, Jim. Wilder was very critical of Monroe as her post-mortem fan following built up, as if he wanted to strip these people of their illusions about her. Sure do envy you for seeing SLIH in 1959, by the way. What I remember is that mid-60's reissue with "Irma La Douce", which played exclusive at drive-ins in my area ("Irma" also ran heavily on tandem bills with "Tom Jones"). Arthur Marx (son of Groucho) visited the set of "SLIH" one day. Wilder told him that it would either be a classic or the biggest flop of all time. When Jack Lemmon was on the Larry King show, he explained the maracas scene thusly: The scene, as they rehearsed it, just didn't play well; nobody could figure out why, since on paper it was funny. Wilder thought for a few minutes, then gave Lemmon the maracas and told him to shake them after every line. That, said Lemmon, was what made the scene work. still like One Two Three a little better than this one for Wilder comedy.. I very much agree with you about Some Like It Hot-- it's not nearly as laugh out loud as The Palm Beach Story, which seems its clear starting inspiration, but it gets at a deeper funniness-- Lemmon's emasculated insecurity, Monroe's un-self-conscious sexiness (if you can fake unselfconsciousness, you've got it made), and as you say, the underlying menace of genuinely deadly gangsters. I suspect one reason Robinson didn't want to be involved was that he had played enough parody gangsters by then, he didn't want to trash his own legacy further; he didn't know Wilder was making something more substantial than Larceny Inc.
By the way, isn't it funny that Sabrina has become one of the few older movies that everyone seems to have seen? When did that happen? 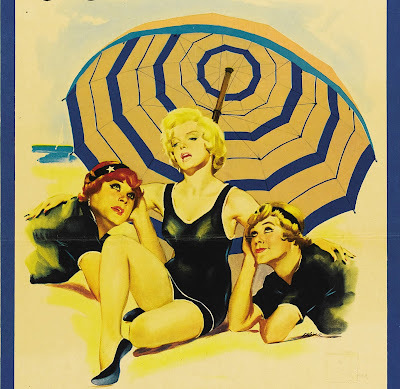 It was before the remake, even, but I'd bet more younger people have seen it than Some Like It Hot or The Seven Year Itch, which would certainly have been considered more famous back in the 70s or 80s. There is an Audrey Hepburn cult out there among young women, the spiritual opposite of the Marilyn cult in many ways. Yes! "Sabrina" was huge among college girls when I was running shows. Young audiences were familiar with it and most had seen it before, although that's been several years ago now. Is the Audrey Hepburn interest currently as strong? Where are the non american posters???? I was 12 years old when I saw some like it hot on easter sunday at the newly renovated Loew's state in times square, and the house of course was packed, the laugher loud and continuous. I can still remember how wonderful the film was to this 12 year old. My God 50 years. >>Is the Audrey Hepburn interest currently as strong? I think so--Eastman House seems to do a Hepburn series every couple of years, and she's on a lot of the pre-packaged poster art at Target. I can understand MM's appeal in the 50s, but for me looking back now, she seems a cipher. The success of any of her movies seems dependent on the whole package. I can't sit through a movie just 'cause she's in it (like I can for, say, Barbara Stanwyck).